It is not uncommon to accidentally delete a bunch of Emails while trying to clean up your Mail Inbox, only to realize that some of those emails were important and needed to be left alone. 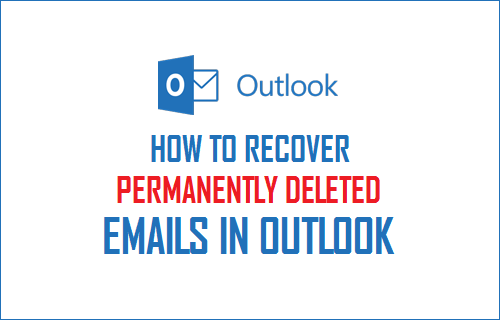 You will find below the steps to recover both Recently and Permanently Deleted Emails in Outlook. When you delete Emails in Microsoft Outlook, the deleted items are simply moved to “Deleted Items Folder” in your email account, before being permanently deleted after a set period of time. As you will agree, this is a good safety Mechanism in Outlook; this can easily save your day in case you accidentally or intentionally end up deleting an important Email from your Inbox. 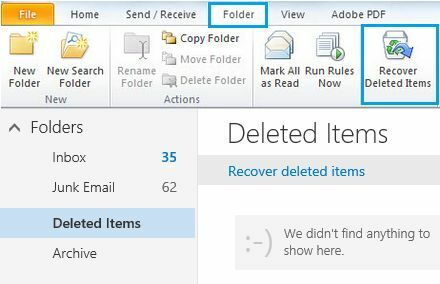 In case you just deleted an Email in Outlook, you can easily recover this Deleted Email by clicking on the Deleted Items Folder (See image below). Now, imagine the worst case scenario of a user who ends up Permanently deleting an Email. This can happen when you delete Emails from the Inbox and also end clearing the Deleted Items Folder. Another way of permanently losing Emails is when you delete Emails and come back to look for them after a long period of time. In such cases, deleted Emails won’t be available in the Deleted Items Folder. Luckily, there is a way to recover permanently deleted Emails in outlook. 1. Login to your Microsoft Outlook Account and click on Deleted Items folder. As you can see in the image below, there are no items in this folder. The folder has been emptied and all items have been permanently deleted. 3. Outlook will start retrieving permanently deleted items from Microsoft Exchange server and list them for you by date deleted (See image below). 4. Next, select the deleted Email or Emails that you want to recover and click on the Folder Shaped Recover button, located at the top left corner of your screen (See image above). 5. Outlook will start Recovering your deleted Emails. Once the recovery process is completed, you will find Deleted Emails Restored back in the Deleted Items Folder. From this location you can move the Email back to Inbox or any other Folder that you want to move the Email to. Note: We do not know whether this method works in case the Emails were deleted a while ago (12 months or more).